It is in the shade of a hilly pine forest of 21ha, located at the gates of the village of Muy that you will find Camping Les Cigales **** which will welcome you in an exotic setting with decoration marked by the Inca and Mayan cultures . Just 20km from the beaches of the Var coast and backed by the reliefs of the hinterland where the Verdon has dug its gorgeous gorge, this campsite is ideal for successful holidays in the South. On site, you will find a vast aquatic area of 1500m²! The whole family will be seduced by this water park. If children will enjoy the slides, the little ones will play safely in the play pools designed for them. Meanwhile, parents will relax in the wellness area consisting of a 110m2 pool with whirlpools and massage jets and surrounded by Mayan statues and a crocodile that spits water. The spa pools and massage jets, the large lagoon with waterfall and the paddling pool are heated! You will also find a pond on the campsite where you can indulge in fishing (rental of fishing rods mandatory and you leave with the fish caught). During the school holidays (from 02/04 to 30/04), the weekends and bridges of May / June and July / August, the campsite will punctuate your stay with entertainment during the day and evening. During the Easter or summer holidays, the animation team regularly organizes theme nights around which the whole family can meet: dance, karaoke, concert, show, cabaret, etc. This is an opportunity to meet for a drink on the terrace of the bar. Your children will not be bored in this campsite! Indeed they will be welcomed in the Club 4/12 years where many manual activities, outdoor games, treasure hunts or sports activities will be offered. To ensure you a successful holiday at the gates of Provence, camping Cigales offers varied services and quality. In addition to the restaurant and snack where you can eat according to your desires or choose to take your dishes, the campsite also has a feeding point. And for your well-being, the Cigales offer a hairdressing service, a beauty center (hammam, spa and massage) and a fitness room (with supplement). Beach and swimming enthusiasts will find their happiness around Fréjus and St Raphael just 20 kilometers from the campsite. Hiking enthusiasts will not be left out. The hinterland of the Var is covered by dozens of hiking trails that invite you to meet an authentic Provence punctuated by charming perched villages with a southern accent, the spectacular Gorges du Verdon or a seaside dominated by the Massif des Maures or the Esterel massif. Around the campsite the possibilities for water sports are also very numerous (sailing, water skiing, diving, etc.). 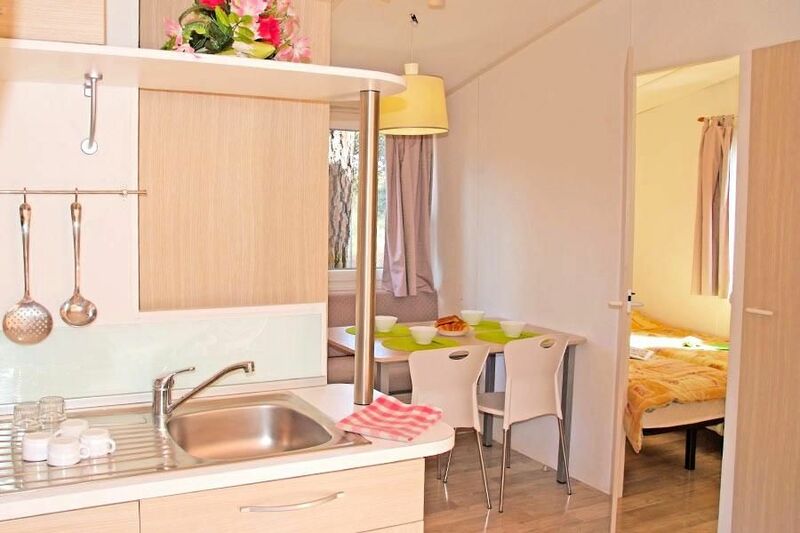 Mobile home Idaho 3 rooms 4 persons of 24m ² approximately air-conditioned, composed of a corner living room, a corner cooks equipped, a room with a double bed (140x190), a room with 2 simple beds (70x190), a shower room, separate WC and a semi-covered terrace. The Mobil Home includes a lounge area with TV, a kitchenette equipped with fridge, microwave, capsule coffee maker, cooking utensils and crockery adapted to the number of people in the accommodation. The terrace has a garden furniture. Take the A7 / A51 towards Aix en Provence, then the A8 towards Nice. Take exit 36 ​​towards St Tropez and continue on the N555 to Le Muy.